Five years ago, volunteer firefighter Zach Green was struck by how easy it was to become disoriented in the dark and by heavy smoke. "Later that night I watched a special report about the World Trade Center and it mentioned how photoluminescent technology in the stairwells helped people get out," he said. 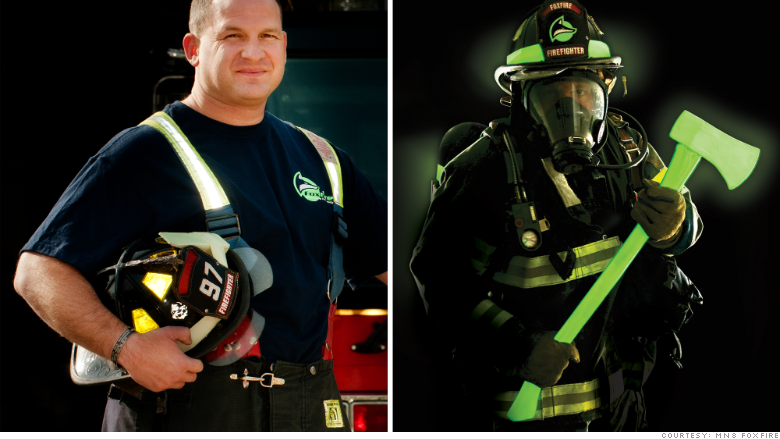 So the Cincinnati firefighter developed a prototype for a glow-in-the-dark silicone stretchable band to put around a helmet. It worked so well that Green realized he was on to something. He spent the next six months making the bands and pitched them at fire stations around the city. "I made $5,000 basically selling the bands myself," he said. In 2010, Green launched his company MN8 FoxFire. Over the next two years, he refinanced his house, maxed out credit cards and raised $1.5 million in venture capital. Today, he said his heat-resistant safety bands are being used by more than 60,000 firefighters nationwide and overseas. He plans to expand it for stadiums, buildings and schools around the world.